A piping hot golden brown fried turkey with crispy skin as well as tender, juicy flesh that is not greasy but with the most heavenly aroma and served fresh from the Butterball indoor electric turkey fryer without having to reheat – now isn’t that just too wonderful to describe? It feels great to be in total control where Thanksgiving turkey is concerned, from the time you buy the raw turkey down to the seasonings used. But the traditional way of frying a turkey involves a pot of hot oil and an open flame outdoors which is not exactly appealing to some. For this group of people, there is the popular Butterball indoor electric stainless steel turkey fryer. It comes in 2 sizes, the XL and the large electric turkey fryer. It is certified safe for indoor use. The XL turkey deep fryer can accommodate a 20 pound turkey. As for the smaller size fryer, it can easily fit in a 14 pound bird. 1.1.2 How Much Oil Does The Butterball Turkey Fryer Use? 1.1.3 What Type Of Oil Is Recommended? 1.1.7 How Much Food Can The XL or large cooking basket holds? 1.1.8 Cooking Time – How Long Do You Deep Fry A 14 Pound Turkey? The whole outer unit is made of stainless steel and the inner pot is porcelain coated. The design of the turkey cooker with its one piece lid ensures that the hot oil is kept safely inside the inner pot without the danger of the oil boiling over or splattering on the countertop while frying. The closed lid minimizes oil splatters and helps in retaining heat inside the fryer. It comes with a built-in filter to minimize moisture. This ensures a safer and cleaner work place. Added to this safety design, it also uses 33% less oil than the traditional fryers. It comes with a maximum mark for the safe oil level. About 2.75 gallons (11 qts) of oil is enough for the extra large capacity turkey fryer. About 2 gallons of oil is needed for the large capacity frying machine. The oil needs about 35 – 45 minutes to heat up to 375 degrees F. Close the lid at all times whether heating up or frying. Peanut oil that comes with a high smoke point is recommended. Besides, it has a mild flavor. The analog control panel is attached to the heating element and can be removed from the main body. You have to turn the dial to set the temperature. For frying turkey, you set it to 375 degrees F. When desired temperature is reached, the ready light illuminates. You can now slowly lower in the turkey. To set the time, you have to push the timer button to desired time. Then release the button. Timing has begun. The machine comes with thermostat temperature control. It maintains a steady temperature up to 375 degrees Fahrenheit. The ready indicator light will light up once required temperature is reached. The indicator will light up if oil is used. For steaming or boiling, you have to set the temperature to 210 degrees F. It is ready when the water is boiling. The indicator light will not turn on when water is used instead of oil. It also comes with an auto shut-off feature that shuts down the machine when temperature gets too high. This is certainly good to hear as hot oil boiling at too high a temperature may cause a fire. In the event that your fryer shuts down, you’ll have to reset it again. First, you have to unplug the unit. At the inside of the control panel, there is a small hole. You have to use a toothpick to insert into this hole to reset it. The built in digital timer minimizes over-cooking and allows for a perfectly fried bird. It comes with a breakaway magnetic cord. The cooking basket is made of aluminum for the extra large fryer while the large one has a chrome coated wire cooking basket. A stainless steel basket lifting hook is included. The lifting hook makes it easier and safer to lift or lower the turkey into the bubbling hot oil. The basket comes fitted with a patented drain clip. There is a drain clip mounting hole on the top rim of the stainless steel body. The purpose of the drain clip is for you to hang the basket with the just fried bird onto the drain clip mounting hole for cooling and oil draining purposes. How Much Food Can The XL or large cooking basket holds? For the XL turkey fryer, you can cook up to a 20 lb. turkey, 5 lb. 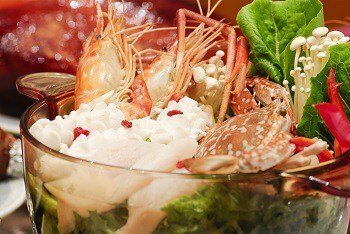 of chicken wings, or a large seafood boil. As for the large L turkey fryer, the basket can hold a 14 lb. turkey, 3 lbs. of chicken wings, or a large seafood boil. Cooking Time – How Long Do You Deep Fry A 14 Pound Turkey? It takes about 3.5 – 4 minutes per pound of chicken. This means that a 14 pound bird will take about 50 – 60 minutes to finish cooking. Make sure that the internal temperature is 165 degrees F in the breast and 180 degrees F in the thigh. The inner pot has a drain valve for easy removal of used oil and for easy cleaning. There is a valve spout attachment provided for this purpose. Its one piece lid can be removed for a more thorough cleaning. The pot, basket, lid, drain valve are dishwasher safe. The Butterball indoor electric turkey fryer by Masterbuilt allows for a safe and hassle-free way to deep fry your scrumptious turkey at home. 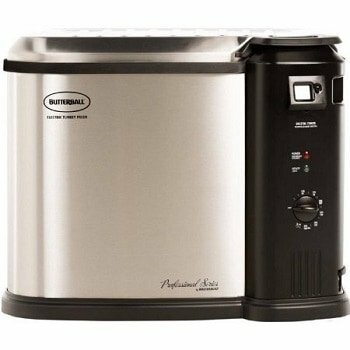 Besides frying turkey and chicken, you can also steam vegetables or boil seafood such as crabs, lobsters etc in this multi usage Butterball indoor electric turkey fryer cooker. After frying your turkey, you can make use of the hot oil to fry your French fries, fish, etc. and have a magnificent feast. Or perhaps steam some juicy lobsters for an impressive meal. Fry using oil and steam or boil with water. With this large capacity fryer cooker, you can easily cook for a large group of visitors. Always defrost your turkey to room temperature (USDA recommends 24 hours for every 4 to 5 pounds if defrosting in the refrigerator), make sure no moisture remains on turkey (pat dry with paper towels inside cavity as well) and no ice crystals inside turkey. Water and hot oil are dangerous combination. For the turkey to have absolutely crispy skin, the whole bird has to be submerged in the boiling oil. A 14 pound bird using the large capacity fryer will end up with a bit of skin outside the oil level. The part above the oil will not have the nice crisp to its skin. The trick to prevent the cooked turkey from sticking to the basket is to first lower the empty basket into the hot oil to coat it with an oily layer. Then only put in the raw turkey onto the hot oiled basket to lower into the boiling oil. Always lower or raise turkey slowly to prevent sudden agitation of oil. This prevents splattering and severe scalding. One customer commented that if you have a large 20 lb turkey for the large capacity fryer, get it cut into half and fry them separately. They will still turn out superb. By following the 3.5 – 4 minutes per pound for cooking time rule, your turkey should be perfectly cooked. To be completely sure, try inserting a meat thermometer about 2″ into the deepest part of the breast meat. The internal temperature should be 165 degrees F (74 degrees Celsius). Before pouring in the oil, make sure the drain valve is properly sealed and closed with the safety cap provided or you might end up with oil all over your work top. For boiling or steaming usage, there is no ‘ready light’ alert (ready light alert is only for deep frying with oil). Instead, set temperature to 210°F. When water starts to boil, put in your food ingredients for steaming/boiling. This Butterball electric turkey fryer is meant for indoor use. If you wish to use it outdoors, then the covered patio or the garage is recommended. Never use it while exposed to the elements. For cooking a piece of turkey breast only, the cooking time and temperature is slightly different. You still set the initial temperature to 375 degrees F.
Estimate cooking time is about 7 minutes per pound. Once breast meat is lowered into the hot oil, then you have to reduce the temperature to 325 degrees F and maintain it at this lower temperature for the duration of the cooking process. For chicken wings, once the 375 degrees F temperature is reached, then put in the wings to fry. Your crispy wings will be ready in about 10 -15 minutes. Whether you use it for frying, steaming or boiling, always preset the temperature to 375 degrees F. Then only lowered it to your desired temperature. 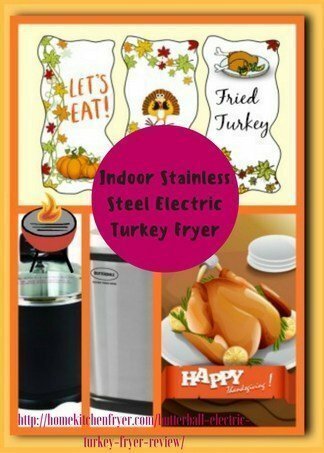 With this Butterball electric turkey fryer boiler steamer, looks like you will get a lot of uses out of it. Yes, it is a turkey fryer cooker but it is not just about turkey. You can cook delectable and tasty varieties of all your favorites in this Butterball multi cooker fryer from Masterbuilt. Having these optional fryer accessories allow for a safer and hassle-free frying experience.